A hundred years ago… during the week just passed, King George V visited the by then “stabilising” Western Front for the first time (somewhere in the French section, can’t find out where from Googling, but close enough to get his boots dirty). In the coming days, The Austro-Hungarians engaged the Russians at Limanova in the Galicia-Karpathian Mountains (December 1-13, heading for a Russian defeat with 30,000 casualties to 12,000). 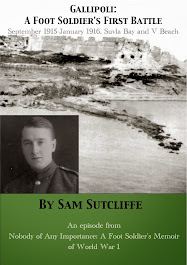 Further evidence of the truly “world” reality of what was then dubbed The Great War developed with skirmishing on India’s North-Western Frontier (“caused by German intrigues” says www.greatwar.co.uk), the arrival of the first Anzacs in Suez, the capture of the pro-German rebel leader General De Wet in South Africa, and a Portuguese Expeditionary Force sailing from Lisbon to Angola to begin a belated response to the German invasion of their colony two months earlier. Tommy (as my father, Sam, called himself in the early, third-person part of his memoir) and his older brother Ted had both emerged from childhoods immersed and entangled in local C of E churches. The family, having “come down in the world” when the boys were tots in Manchester, and then endured many years of poverty in Edmonton, north London, had to a considerable degree depended on a “tin church” mission to the poor for simple charity and any kind of welcome into the community (from children’s outings to their parents’ participation in organising special events). 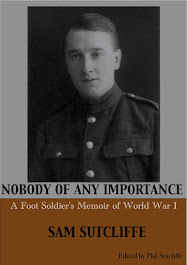 ‘An excellent breakfast on Sunday morning prepared Tommy for the preliminaries to the church parade, which included much standing around before the Battalion’s approximate one thousand officers and men lined up in an apparently endless chain of rows of four. To the rear, in the distance, the Colonel’s white horse could just be seen. That important man had placed himself so that, having given the orders to set the column in motion, he could make a spectacular dash on his flying gee-gee to the head of the column and take up his position as the leader of this huge threat to Kaiser Bill. Fortunately, the soldiery knew all the noises the Colonel would make in order to get the column moving churchwards. When they heard “Batt-alion-a!” they came to attention; “Ayon on er raye!” and they all turned to the right; “Ee aa!” obviously meant “Quick march!” so they all stepped off with the left foot, as they had been taught. Soon, caps in hand, they all filed into the fine, old, parish church. As he walked up an aisle, Tommy looked around and felt compelled to admit this church looked richer than the one he attended — the carvings more ornate and numerous. This being a military service, it was taken by the vicar himself. He had a clear, tenor voice but, thought Tommy, we score over him because our old man in Edmonton is a Prebendary and a Surrogate and other impressive things which the Bunbridge vicar wasn’t — and our vicar had a deep, old-port, very rich sort of voice while Bunbridge’s was bell-like, and not so grand that it could even charm the choirboys and induce them to stop fiddling and listen. Considering that many soldiers present had only the vaguest notions about the order of events, the service proceeded well and smoothly — although, during the singing of one well-known hymn, the vicar had to call a halt in order to insist that the words as printed should be used. For instance, after the third repetition of “Glory, glory, hallelujah” the final line wasn’t “Then we all went rolling home”, at least not on his hymn sheet. * Sadly, this photograph didn’t survive the decades and I never saw it. ** Tonbridge had two cinemas at the time, the Star on Bradford Street, opened in 1910, and the Empire Picture Palace, Avebury Avenue, opened earlier that year. A hundred years ago today… British and Indian Regiments concluded the Battle Of Basra by capturing the city from the Ottoman Empire, thereby “securing the Persian oilfields” (for the time being, anyway). But more significantly, the day before, the First Battle Of Ypres ended in a crucial stalemate; the German Army called it quits although the casualty lists, while terrible for all, showed a huge imbalance between them and the Allies – 46,000 Germans, 85,000 French, 56,000 British (out of 163,000 men involved), 22,000 Belgian. During the next few days several German leaders argued that the war could not be won now, but Generals Ludendorff and Von Hindenburg (promoted to Field-Marshall on the 27th) successfully urged continuation... of the slaughterous stasis they had barely begun to explore, as it turned out. Meanwhile, down in Bunbridge, alias Tun/Tonbridge (the spelling adjusted some years earlier to avoid postal confusion with Tunbridge Wells – really! 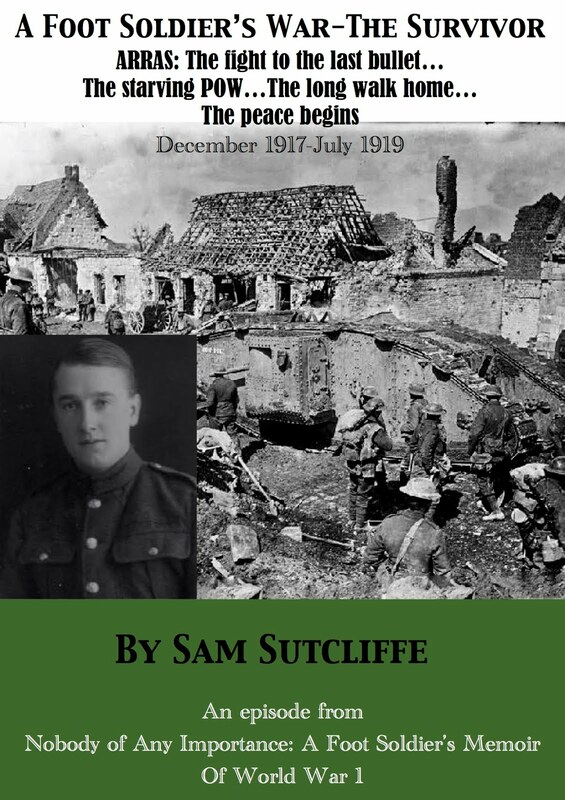 ), under-age Royal Fusiliers volunteer Sam Sutcliffe, his older brother Ted, and their Edmonton pals enjoyed their ongoing pleasant surprise at alighting in a Kentish town rather than the Western Front. Tommy remembered that other early-morning, cold-water enthusiast Mr Frusher*. So he asked if he might indulge in this discipline and received permission. He associated the habit with good living, good clothes, and success. Churniston did not ask this favour for himself, but expressed his admiration for Tommy’s pluck. At 7 the next morning, there was a noticeable nip in the air. The cork bath mat had a nice sloppy surface on which Tommy stood while running his four inches or so straight from the chilly, mains, water pipes. His previous cold, morning dips had been those enjoyed by all at Scout camps — a preliminary gallop down the hill before plunging into the stream, fun pushing or pulling in the slackers, marvelling at the mystery of Frusher’s floating soap** and other diversions. * A formative influence on Tommy/Sam’s childhood and teens back in Edmonton – vicar, choirmaster, Scoutmaster, piano teacher. ** Proctor & Gamble’s Ivory brand, marketed in America from 1878, did float; at the time, the company declared it an accidental outcome of the manufacturing process, but in 2004 a company archivist revealed it had been a planned gimmick, good for sales and economical because it involved whipping bubbles of air into the soap. 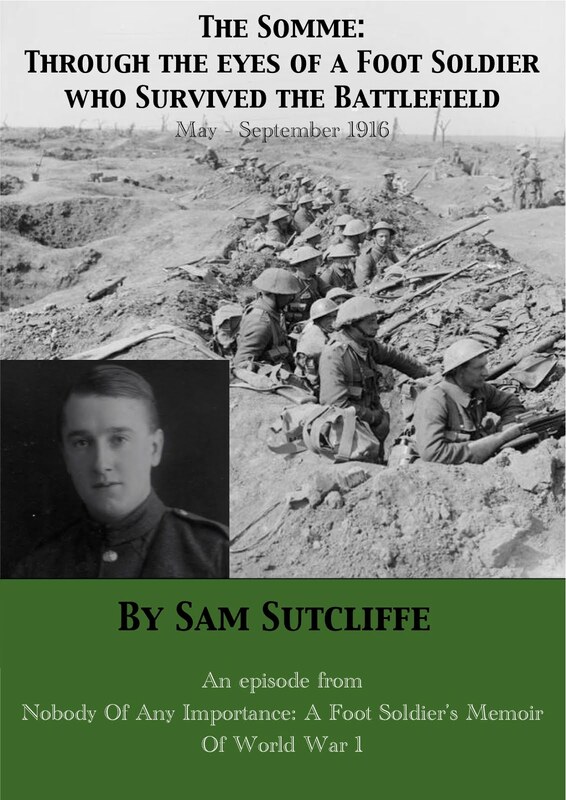 ‘On the first Friday night, they had instruction in marking out and digging trenches. Then Saturday morning saw the troops at the railway sidings. A long line of carriages and several goods wagons had been allocated to the Battalion. The windows already displayed Company signs, A, B, C and so on, and they practised entraining in correct order. They loaded quantities of picks, shovels and spades into the wagons, along with large boilers, and sacks full of sufficient unbreakable enamel mugs and plates for all the men. People tend to visualise a trench system as one long, straight line but the British Army at that time used a different design. A trench would run straight for perhaps ten yards, then take a 90-degree turn to the right for three yards, becoming narrower too, then a similar left for three yards, then right again and thereafter resume the original direction and width.